Our last survey on hybrid cloud strategies told us that the vast majority of companies will be keeping on-premise infrastructure to varying degrees. So, this time we wanted to find out how they see scope changing, what technology people are planning to use, and how they plan to monitor and manage performance for remaining on-premise workloads. In February of 2019 we surveyed over 1,400 IT practitioners via email and have compiled the results to share. Our last survey revealed that (85%) of respondents use the cloud in some capacity. 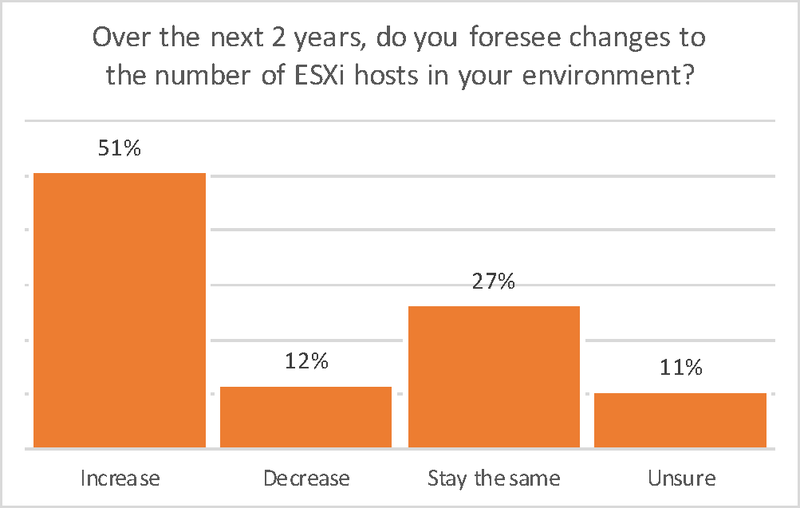 Despite the high-percentage of cloud adoption, results from this survey tell us that (51%) of respondents expect the number of ESXi hosts in their environment to increase in the next two years, and only (12%) foresee the number of ESXi hosts to decrease. 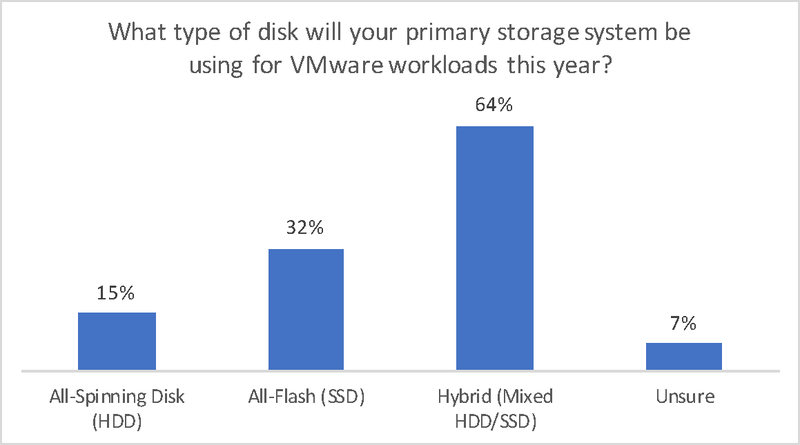 Almost two thirds (64%) of respondents use a mix of HDD/SSD as their primary storage for VMware workloads. To little surprise, only (14%) of respondents have no complaints in regards to the performance of their VMware hosted applications/services. Additionally, half of the survey participants selected SQL DB and Virtual Desktops / Terminal Services as applications they would like to see improved performance. (58%) of respondents ranked Latency or Cost as the most important attribute to their organization when considering new purchases/upgrades and (42%) ranked Manageability as the least important attribute. Only 7% of respondents would not see value in cutting latency in half with a software only solution. This question was an open text format. The word cloud below includes summarized results with larger text indicating the most common responses. Solarwinds, built in VMware tools, and vRealize were some of the most popular monitoring tools. 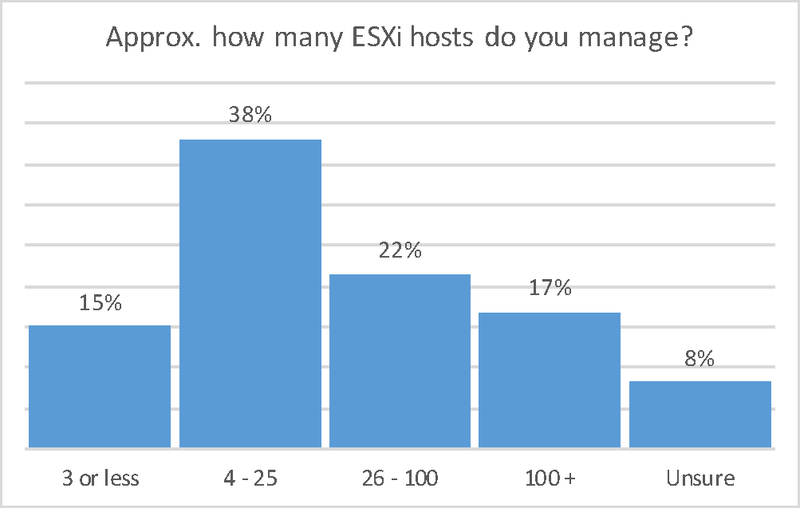 77% of respondents currently manage 4 - 100+ ESXi hosts and 78% of respondents think that the number of ESXi hosts will either increase or stay the same in the next two years. The top 3 applications/services that respondents would see value in increased performance of are SQL DB, Virtual Desktops, Backups, and File Services/Share Point. Latency and Cost were the two most important attributes to organizations when considering upgrades and purchases. Over 50% of respondents would find value in a software only solution to reduce latency. We are very grateful to all of our survey respondents who helped us learn about how they monitor and manage performance of their on-premise workloads and their VMware usage plans in the next two years. If you could benefit from a performance boost, request a free-trial or check out the Performance Calculator to find out the performance increase Infinio would deliver in your environment.